Alan Paul, Director of Man of La Mancha and STC Associate Artistic Director, sits down with cast members Anthony Warlow (Don Quixote), Amber Iman (Aldonza), and Nehal Joshi (Sancho) to discuss how they came to be a part of the production and what they have discovered along the way. And visit YouTube.com/ShakespeareTheatreCo to see more in-depth excerpts from this interview. Alan Paul: What drew each of you to this production? Anthony Warlow: People often ask me what my favorite musicals are, and they’re The Secret Garden, Man of La Mancha, and My Fair Lady. In Man of La Mancha, Dale Wasserman really created a fantastic play. Nehal Joshi and Anthony Warlow, photo by Scott Suchman. Nehal Joshi: Man of La Mancha is one of the great musicals of all time, and Sancho is one of the great fool/clown characters in all of musical theatre. And of course, I’m from Washington, and I’ve always wanted to work at the Shakespeare Theatre. Amber Iman: I remember the first audition. I knew all of the other women in the room, and they were all older than me, dressed completely different than me. They had on cocktail dresses and I had on combat boots and fishnets. I thought, “I’m in the wrong room on the wrong day at the wrong time.” I didn’t really think I would be considered for it—these opportunities don’t come to a 27-year-old brown girl every day. The role is so juicy. I couldn’t wait to dive into the whole thing. AP: What’s been the biggest surprise or discovery you’ve had since we started? NJ: I’ve been surprised by how deep it is. Dale Wasserman was so smart for not writing “Don Quixote the Musical.” Instead, it’s about this man Miguel Cervantes, and this character he’s created, a man who has failed every step along the way but he’s been saving this one last golden ticket under his arm. AW: If anything that’s the romance of it. This one man comes and changes these people’s attitudes on life. I think we want the audience to come away with a newfound appreciation for the power of the imagination, that it’s the most powerful thing we have. Quixote doesn’t control what happens to him. What gives him greatness is that he dares to dream. It’s a piece about how optimism transforms us, told through the eyes of a writer at the end of his life. It’s not the work of a young man, it’s the work of someone who was a slave, who had been through war, who understands suffering. And still, despite all that, he says he would rather dream an impossible dream than accept life as it is. Amber Iman, photo by Scott Suchman. AI: In a similar sense, it transforms Aldonza. She’s a whore. She doesn’t have any family. There’s no love, no ambition. And then this man comes in and places an idea in her mind. Of course, she doubts it, fights it, runs from it. But there it is, twinkling in the atmosphere. She begins asking questions of herself: What do I want? What does he want? She’s never been in that place before. AW: He places that seed in her very gently, always gently, and that’s something she’s not used to. That’s the poignant part. AW: This is a hard, harsh environment and Quixote is a hard, harsh character at points. The songs in the show are beautiful, but it’s nice to push away all of the sweetness and find the core. AP: That was a conscious choice. Hope does eventually bubble up at the end of the show, but it comes after some difficult things. The contrast of this harsh world with the beauty that comes through is important. This is also a celebration of the power of imagination and the power of the actors’ craft. We don’t have pieces of scenery that fly in to tell us that the windmill has come in or that we are in the Inn. We have little bits and pieces and it’s up to us as a group of storytellers to help the audience connect the dots. AW: Quixote, in one of his opening speeches, says, “Come, enter into my imagination, imagine what we are doing here.” That’s the core of this production and that is exciting for me. Nehal Joshi, Anthony Warlow, and Amber Iman, photo by Scott Suchman. NJ: There is a real return to the innocence of childhood. Dale Wasserman writes about this in his autobiography. A lot of people want to make the play a religious allegory about believing in things you don’t necessarily see, but it’s bigger than that. It’s about returning to the innocence inside of you. AW: That innocence is what is sweet about this production, surrounded by the harshness of it. NJ: I hope that people have a good time, but more importantly that they see the unseen in the piece, also in the way it’s produced and the people involved in it. Maybe that will make them think about the unseen people in the world outside of the theatre. In the casting, in the characterizations, we’re trying to talk about the society that these people lived in, and in some ways it mirrors the society we live in today. It is my honor to have Anthony Warlow at the Shakespeare Theatre Company. Anthony is a magnificent talent, and one of the best baritones in the world. 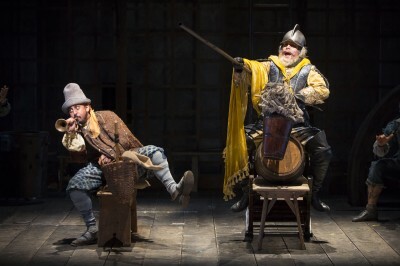 Man of La Mancha asks its leading man to deliver three roles: the writer Cervantes, the aging Alonso Quijana, and the “dauntless knight” Don Quixote. The roles require tremendous spirit, and an enigmatic quality. They also require an extraordinary singing voice. Anthony has all of that. Amber Iman was a joyful discovery during the audition process. 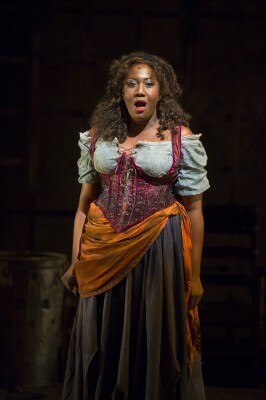 Aldonza is a complicated role, and we needed someone who could sing and act this demanding material. We also needed someone with authentic power onstage, who could convey toughness and vulnerability. As far as I’m concerned, there was BA and AA, Before Amber and After Amber. Her audition was very special, and she will be a wonderful Aldonza. Nehal Joshi and I have been friends for a long time and have worked together before. A year ago Nehal and I ran into each other on the street in New York City. STC had just announced La Mancha and we both started talking about Sancho. I have always seen Sancho as a caregiver to the aging Quixote, and I knew Nehal could find the humor and warmth of this part. I also knew he had the boldness to find his own authentic interpretation. 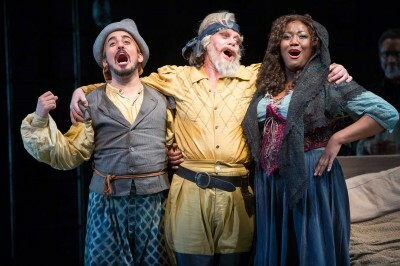 Man of La Mancha plays Sidney Harman Hall through May 3.